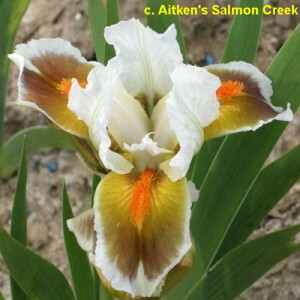 'Pretty Pixie' (Bennett Jones, deceased, by J. Terry Aitken, R. 2010) Seedling #740. MDB, 6" (15 cm). Midseason to late bloom. Standards white; falls white, sharply defined spot that is gold at base blending to deep brassy-gold near tip; beards white. 'Artful Tradition' X 'Dainty Pinafore'. Salmon Creek 2010.